A wedding an event that every couple so dearly anticipates. It is also the culmination of every couple’s lives. It is a stepping stone to living another stage in their lives as husbands and wives. While planning a perfect wedding is quite a big challenge for every couple, it is an exciting thing to do. Starting from the budget, people who’re going to be part of the entourage, food to be served, and most especially the venue of the wedding rites. 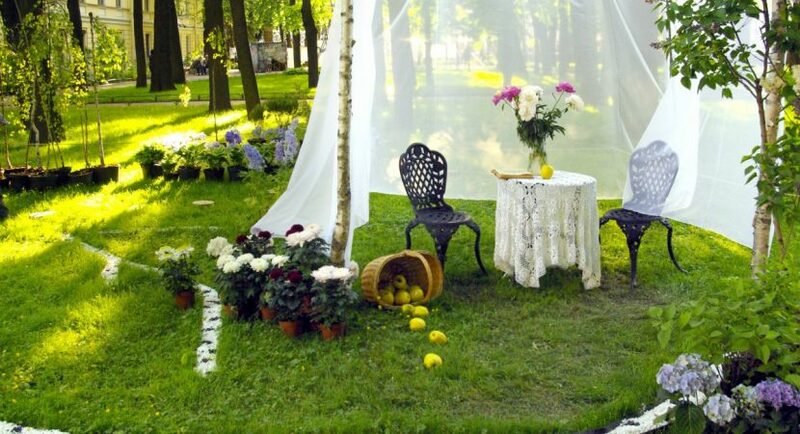 According to study, garden wedding is the famous choice among couples since it creates a perfect romantic atmosphere. Hence, if you plan to have a garden wedding, we have listed the things below to help you out turning in your backyard to a perfect wedding venue. In any wedding ceremonies that you are planning to do, it is a fundamental requirement that you have to check the rules and regulations that your local office may impose for a garden wedding. You need to plan and live by these rules to avoid any conflict in the future. Choosing the right and best theme that suits your garden wedding can ultimately give you a personal touch and personality in your ceremony. Pick an idea that fits your personality as a couple. Also, personalized themes are more attractive too. Also, for elegant backyard weddings, a nostalgic design or natural look that’s full of green makes your rites fresher and more romantic. You may exaggerate the flower centerpieces as this is going to add more life to the garden. What else is the best excuse to have your garden trimmed and get lawned? Well, a garden wedding is a solution to that. A little bit of landscaping and lawn mowing can make a big difference to the occasion. Try to make a list or sketch of how your garden wedding set up looks. Plan the design, the colors you want to add, and of course the trimming you will do. You may also add garden beds which will enhance the layout of your landscapes to make it more elegant and refreshing. A wedding will not be perfect if there are no proper wedding materials to be used. It is always best that you plan very well when it comes to choosing the perfects dress for the bride and a suit for the groom to wear. Also, choosing a wedding ring is an important process to decide. In getting a perfect wedding ring you have to plan for the budget, narrow down your ring choices, and of course, you have to search as early as you can. Lastly, you can try something different from the usual and traditional wedding rings. For example, custom wood rings are perfect when choosing a garden wedding. It fits your theme and makes a wedding experience more unique. When you plan to have a garden wedding, you always have to anticipate the weather. It is best that you have to be aware of the weather forecasts ahead of time so you can plan accurately. Well, there might be surprises with the season, but predictions are there to help you out. On the other hand, lightings set the mood for your wedding. Spend a little more time in choosing what types of lightings you are going to use. For garden weddings conducted in the afternoon, natural light is best, but for evening occasions, candles and lanterns can add a romantic effect. In most cases, planning a wedding is not an easy task. For every couple, it takes a lot of effort, dedication, and passion for having a perfect wedding ceremony. Both of you should work hand in hand when it comes to decision making. Finally, the wedding comes only once, and no matter how you celebrate and do it, the most important thing are your vows you promised to live a happy ever after love story.